Kermans is perhaps best known as Indianapolis' area rug store. We got our start with area rugs and continue to carry one of the largest, most diverse selection of area rugs available in Central Indiana. If you're shopping for an area rug, look no further than Indianapolis flooring store, Kermans. Not sure how to choose the best area rug? Wondering where an area rug fits in your home? We asked our in-house flooring design experts and they came up with five great area rug trends to try in your home. Often an area rug is an accessory - and a great accessory at that - but sometimes you find a rug that has a strong color or pattern and you fall in love. In that case, design the room around the rug for a space that really shows off your personal style. An area rug is a fairly low cost way to redesign a space. That gives you a little more flexibility and sense of fun. Pick a circular rug, a boldly patterned rug or a bright color that plays up the accents already in the room. Area rugs can be great additions to high traffic areas. Use a wool rug that can be cleaned easily and you'll have less maintenance to worry about on the carpet or hardwood floor beneath it. If you have a large, open room consider using more than one area rug to define spaces within the room. You can also layer a smaller area rug on top of a larger one to add texture to any size room. Area rugs are truly beautiful works of art - albeit works of art designed to be walked on. If you find a real treasure, look for a quiet space to show it off. 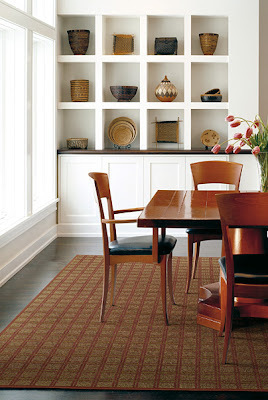 A dining room or den can be the perfect room to let an area rug shine.